The Norman Manley International Airport is located on a picturesque peninsula in close proximity to the historical site of Port Royal, and is approximately 30 minutes away from the main business district of New Kingston. Kingston airport was named in honour of Norman Washington Manley one of Jamaica national hero and one time Prime Minister. There are over 130 international flights a week that depart from Norman Manley International Airport. Norman Manley International Airport (NMIA) is undergoing a transformation which will turn the Airport into a spacious and modern facility and offering services and facilities. A new two-level pier and four passenger boarding bridges are in operation. The airport is referred to by the International Air Transport Association (IATA) using the airport code KIN. 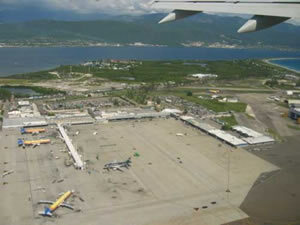 The International Civil Aviation Organization (ICAO) uses MKJP when referring to Norman Manley Airport.